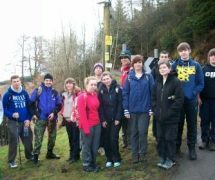 On a cold Sunday in March, a total of 54 intrepid young people, volunteers and youth workers (and a dog) trekked the valley hilltops on a 12 mile hike as part of Rhondda Cynon Taf Council’s successful Duke of Edinburgh’s Award Programme. 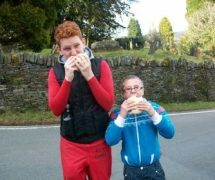 But the kind-hearted youngsters didn’t just undertake the challenge to gain their Awards, they also hope to raise money for 2 Charities: CRY (Cardiac Risk in the Young) – one of our RCT Mayor’s chosen charities, as well as the local Leah-Beth Foundation, which supports children with terminal cancer – this being the charity chosen by Miss Jenna Claridge, RCT Youth Mayor. 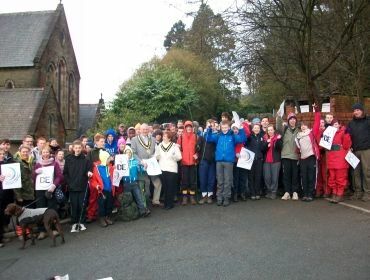 Before they set off on their expedition, Rhondda Cynon Taf Mayor Cllr Doug Williams and Lady Mayoress Mrs Williams met them at the start of their journey at St Peter’s Church, Pentre in the Rhondda to offer their support. 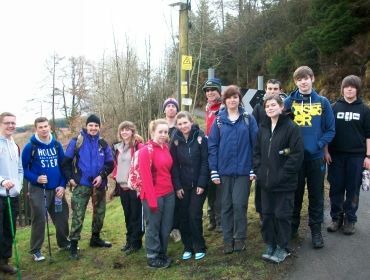 Cllr Williams said, “The Duke of Edinburgh’s Award programme is based on volunteering and helping others. It is marvellous to see so many young people, with their youth workers and teachers, contributing to such a worthwhile local charity in this way. 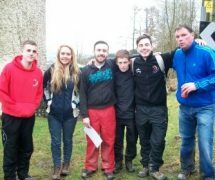 They are an inspiration to others by giving up their time and making such an effort to raise money for such a worthy cause”. RCT Youth Mayor, Miss Jenna Claridge, RCT Deputy Youth Mayor, Mr Sam Akintioye, and young people from St John Baptist High School, Ysgol Gyfun y Cymer, Cymer Youth Club, Miskin Youth Club, Tylorstown Youth Club, Maerdy Youth Club, the Wicid Editorial volunteers from RCT Services for Young People, and a number of Gold Duke of Edinburgh’s Award participants joined together to put their best feet forward. 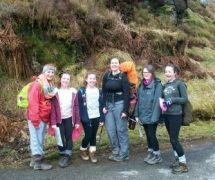 Led by the Council’s Services for Young People DofE Team and group leaders, it was a long journey and the going got tough at times – but bright sunshine helped raise spirits, and all of the hikers persevered and reached their destination in Porth in good time. 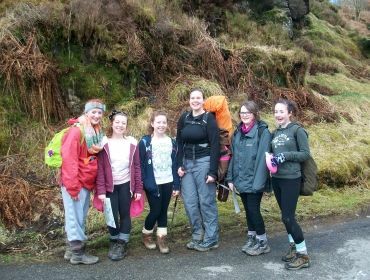 Despite aching legs and a few painful blisters, everyone thoroughly enjoyed the fresh air and exercise, and together with the navigation skills required, this was a good training opportunity for the young people before they undertake their Duke of Edinburgh’s Expeditions this summer.